Trailblazer Lensatic Marching Compass | BUDK.com - Knives & Swords At The Lowest Prices! Overall dimensions: 3" x 2 1/5" x 1 1/5"
Find your way in the wilderness the way your grandfather did - before GPS. With no batteries to die, satellites links to sever or electronics to damage, Trailblazer's Lensatic Marching Compass is an indispensable part of any outdoor gear or preparedness plan. Anyone who spends time in back country - hikers, hunters, preppers and more - should have at least one in his or her pack and/or bug-out bag. Fashioned in the classic military style, this heavy duty compass is perfect for sighting and following bearings in the field. A durable TPU housing protects a liquid dampened compass dial with 2-degree graduations and luminous points for low-light readings. Its long straight side makes it easy to use with a map, and the flip-up lens allows you to take bearings accurate to within 5 degrees. 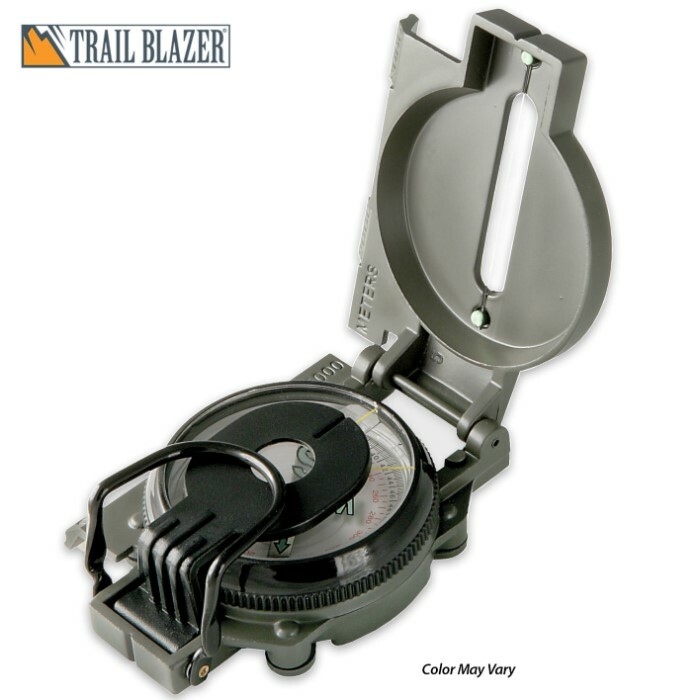 A hinged thumb loop helps stabilize the compass for fast, accurate readings. At 3" x 2 1/5" x 1 1/5", the Trailblazer Lensatic Marching Compass fits easily in any backpack and even pants pockets. Come what may - natural disaster, blackouts, even Armageddon itself - you can always rely on this trusty, low-tech but high-functioning device. Color may vary between black and olive drab.